Near the airport. 24 hour Subway restaurants nearby with other decent restaurants too. We enjoyed having the pool and restaurant right next to us and the free shuttle made the world of a difference! The only good thing about this place was the bed, it was comfortable. i liked the little extras like the coffee maker in the room with the pods !! and the mints on the beds ! The Staff is very courteous and friendly and assisted us with whatever we needed. Facility is very clean and comfortable! We have been there several times over the last 18 months. Did not have a chance to have breakfast because of my schedules. The reception provided a good service. Proximity to the airport. But there are other holiday inns closer as well. Attended the NASP conference. Drove in from Maryland. Very nice accomodations. Holiday Inn Toronto Airport East This rating is a reflection of how the property compares to the industry standard when it comes to price, facilities and services available. It's based on a self-evaluation by the property. Use this rating to help choose your stay! Located just off Highway 401, this hotel provides a free shuttle service from Toronto Pearson International Airport, which is a 10-minute drive away. Free Wi-Fi, wired internet access and an indoor pool are also provided. Floor-to-ceiling windows that open and a 37-inch LCD TV are found in each modern room at the Holiday Inn Toronto Airport East. Coffee-making facilities and a work desk are also included. Guests at the Toronto Airport Holiday Inn can enjoy the on-site fitness center. A business center and a gift shop are also open. Perkins Family Restaurant is on site and serves a menu of American items for dining in, take-out and room service. Downtown Toronto is less than 16 miles from the Holiday Inn Airport East. 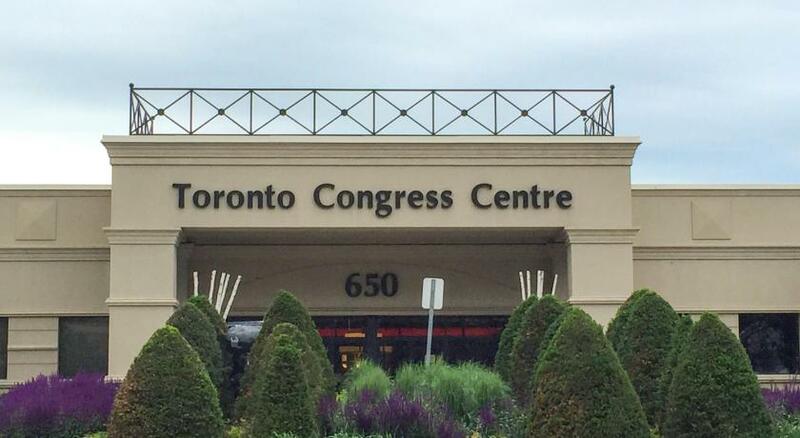 Toronto Congress Centre is just over a quarter mile away. The International Centre is 5.5 miles from the Holiday Inn. When would you like to stay at Holiday Inn Toronto Airport East? This room includes a flat-screen TV, coffee-making facilities, a work desk, sitting area and a window that opens. It can accommodate an extra guest (see Hotel Policies). This room includes a 37" LCD TV, tea- and coffee-making facilities and a window that opens. Please note that the room rate is based on 2 guests. It can accommodate up to 4 guests (see Hotel Policies). This wheelchair accessible room features floor-to-ceiling windows that open and a 37-inch LCD TV. This suite features a 37" LCD TV, individual climate control and windows that open. It includes a sitting area and free Wi-Fi access. House Rules Holiday Inn Toronto Airport East takes special requests – add in the next step! One older child or adult is charged CAD 15 per night in an extra bed. Any additional older children or adults are charged CAD 15 per person per night when using existing beds. Holiday Inn Toronto Airport East accepts these cards and reserves the right to temporarily hold an amount prior to arrival. For any Room Including Breakfast: The Rate includes a coupon redeemable for breakfast in the hotel restaurant. Limit 20 CDN dollars per room per day. Could have checked us in before the hockey group arriving at 3pm. Long lineup and wait. Ended up having to pay for parking and I don’t think I have stayed anywhere in the past 10 years that didn’t include some type of complimentary breakfast also unable to access free Wifi. The staff accused us of taking 2 hand towels and where gonna charge us for them. Check in and check out took forever. The tv remote never worked in the room. They told us that they where gonna charge us half price for parking and then tried to take that back after they said two hand towels where missing. We had to get upset and mad before they called a manager. The room very nice and had great water pressure. We were not told before hand that there is a $100 per night for a damage deposit on top of our stay. They one gentleman was very rude about it, till the manager came out. Not impressed I have booked many hotel rooms in Canada and around the world and never had a damage deposit of a $100 per night. Billing error! Our total bill was $141.02 and we were charged on visa $241.02. I have tried to contact the hotel through email but we are in StLucia so more difficult. Could you inquire for us? Walking all the way to the end of the hotel to use the elevator. When someone turned on the bathroom light the whole room was lit up. Beds were clean but there were a few hairs in the bathtub which was quite offputing. Hotel is ok but in need of renovation. the pool is disappointing and there were no towels available. i had phoned the front desk asking if i need to bring the ones from my room and they’d said no. to my surprise I was left with no towels. someone needs to check and stock up pool necessities. front desk could have more hospitable employees. mini fridge could be in the room would be a nice addition.